Do you want to dedicate (a part) of your holiday the next summer to improve your English? 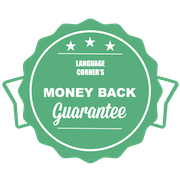 Language Corner offers intensive 2-week English summer courses in Amsterdam from the elementary level (A2) until the intermediate level (B2). On this page you can find the lay-out of each English summer course in Amsterdam. Our intensive English summer conversation courses are offered in July and August and take 2 weeks. Lessons are given from Monday through Friday. Our intensive English summer courses are offered in July and August and take 2 weeks. Lessons are given from Monday through Friday. In the regular summer courses all the aspects of the language will be covered, so speaking, writing, listening, reading and grammar. We offer the English summer courses for the levels elementary A2, pre-intermediate B1 and intermediate B2. In one course you will finish a whole level. We have separate English summer courses for adults and teenagers.